On 30 April 1950, the outstanding career of a young Air Force officer came to a tragic end in an unexplained airplane accident. Don was a very close personal friend of mine and the news of his tragic ending was almost impossible for me to believe. Donald Hepburn Bruner was born in Dayton, Ohio, on 21 February 1921. He was the son of Mrs. Effie Bruner and the late Captain Donald L. Bruner, who made a distinguished name for himself by pioneering night flying techniques for the Army Air Force. Don’s childhood years followed the pattern of Army life, frequent moves and strange lands. He inherited the desire to become a military pilot from the close association he had with his dad during those formative years. Don was graduated from Ponce De Leon High School, Coral Gables, Florida, and prepared for entrance into the United States Military Academy at Marion Institute, Marion, Alabama. He was admitted to West Point in 1939 and was graduated in January 1943. As a cadet, Don was quite active in sports, excelled on the swimming team, and participated in many other extra-curricular activities. His classmates liked him most for his frankness, loyalty, and vehement dislike of unfairness. Following his graduation from the Military Academy, Don was engaged in one of the most important flying assignments of the war — the training of the then heavy bomber crews which brought ultimate victory in the Far East. There, and in subsequent assignments to other flying units, he learned his trade well and rose rapidly. As Senior Tactical Officer, Perrin Air Force Base, Texas, from 1948–1950, Don was looked upon with admiration by the cadets and fellow officers. The cadets in particular considered him a “tower of strength.” He was unbiased in his opinions and had the reputation of always being fair. In both personal and official matters, the cadets continually sought his advice. He was in love with flying and enjoyed the reputation of being one of the best pilots assigned to the base. He was devoted to the service and to his family. Because of his wife’s illness and the demands of his official duties, he had very little time that he could call his own. He devoted attention to both of these matters so that neither was neglected. 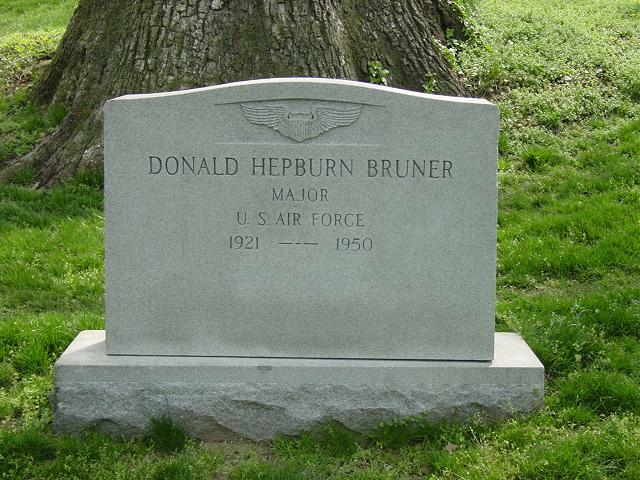 In May 1950, Major Donald H Bruner was laid to rest beside his distinguished father in Arlington National Cemetery. He is survived by his mother, Mrs. Effie Bruner of Coral Gables, Florida. During his short service to his country, Don made a host of friends and proved that he was a sincere, kind, and loyal officer. Whenever a plane flies overhead, we will remember Don, for his fine abilities and his faith in others.